This article – apart from the segment on tips for the winners and losers in the Supercar Series for season 2018 – is a departure from our normal focus on Motor Sport. 10 December last year saw the completion of my 55th year of involvement in the Australian Automotive and Motorsport Industry. In those 20,090 days, not one has gone by where this great industry had not provided me with both an income and the enthusiasm to bounce out of bed each morning knowing the day would bring something new and exciting. In recognition (or some may say in sympathy) of this occasion, I wrote my memoirs in the last quarter of 2017 to coincide with the 55 years point of my career. My memoirs were titled “55 Years in Car Heaven”… Crenno’s insights into Car People. It was a strictly limited book of 155 copies done purely for private distribution to close friends, family, and past and present business colleagues. I thought I would share some snippets of the book, which is all about people in the car business and not cars, which most car industry people normally write about. The cover depicted here has two points of note. The first being the photograph with my father, Henry Crennan, crossing Princes Bridge, walking to Flinders Street Station en route from GMH’s then Head Office in City Road. My father was a GMH veteran of 42 years (1926-1968) in the Purchasing Department. When I told my father I was intent on joining GMH when I finished school, he insisted I join the Sales Department – which he referred to as the GMH ‘lolly shop’ – where all the fun was had, with expense accounts, entertaining Dealers, travel and company cars. My father was the silent inspiration behind why I was so keen to join the company, as at no point did he ever push me towards a career in the car industry or GMH. The second point of interest on the front cover is a photo of my official GM USA employment record, which occurs when you reach a certain executive status. It’s hard to read, but line information reads ‘Race/Ethnic Category: White’. It’s not hard to figure that this control form, with that reference, was not around long after the early 80s. At the very first Sales Conference GMH sent me to, at 22 years of age, the external Sales training guy asked each of the 20 young GMH Sales trainee guys around the room, “What business are you in?” Every response was “the car business” or “the automotive business”. We were then told, very firmly, to never forget that first and foremost, “You are in the people business”. I have never forgotten it, and this was the reason for privately punching away at the keyboard writing about all the people I have been fortunate enough to be connected with over 55 years in Car Heaven. In the book, 80 pages are dedicated to my listing of 2,155 people with whom I have a very clear memory of dealing, complete with details of where and when we first met. My memory of each one of these 2,155 people is as clear today as of those people with whom I had dealings with in my first year at GMH. Over my journey I have always stated the ‘people category’ I have most enjoyed working with and admired most were car Dealers. Why? Because I respect the enormous financial risk they take in running a business with such low dollar return on sales versus capital requirements. I respect their ability, as independent businessmen, to tolerate the often crazy demands the car companies place on them, their ability to instinctively read people, their immediacy in making decisions and in getting on with business, not getting bogged down with politicking. I note with interest (and disappointment) that of the 2,155 people I recall dealing with only 7.2 percent are female. Whilst my automotive business dealings over the past 10 years clearly demonstrates a fantastic turnaround, with now a 25 percent-plus female contact rate, it must be said our industry was, for far too long, a male-dominated business, in particular at the Dealer level. I also dedicate a chapter to nominating my Top 100 People from my list of 2,155 and outline the year we first met, the location, the role they were in at the time of our first encounter and, in one word, I summarise my opinion of what business attribute best described why I had such a strong regard for these special people in my business life. In 30 percent of instances it was the word ‘authentic’ that immediately kicked in. My next two most mentioned attributes were ‘humble’ and ‘enthusiastic’. In the longhand definition section, I note my meaning of ‘authentic’ being ‘true blue, no nonsense, reliable’, ‘what you see is exactly what you get’, ‘good bloke’. The breakdown of my top 100 went: 33 percent OEM/factory people, 33 percent Car Dealers, 10 percent Motor Sport, 4 percent Media, 9 percent Suppliers and 7 percent HSV/HRT staff. I had a lot of fun constructing my opinions of the ‘Team of the Century’ listing of the Holden Directors over my 55 years, with a total of 25 names across the various departmental directorships. No. 1 Managing Director went to Chuck Chapman, with a close second being Mark Reuss (interestingly, both engineers). No. 1 Marketing Director went to John Rock and No. 1 Sales Director was John Bagshaw. Take no prisoners when the factory wasn’t listening and my nomination of the most brilliant Dealer Business brain combined with understated modesty (Michael Cadden). Most Competitive win at all costs motor sport personality. A chapter was also devoted to my opinions on the 20 key reasons why Holden market share fell from over 40 percent when I started at GMH to 7-8 percent 55 years later. I also outline my belief that, with Holden having the IP on most of the crucial industry assets required for success in the car business from their early pioneering days, despite the onslaught of intense competition from Europe, Japan and Korea, I shared the view that their share should not have dropped below 18 percent. Perhaps the chapter I most enjoyed writing was “From the Mailing Room to the Executive Dining Room in nine years, and why I learned more in the former”. Whilst awaiting my cadetship to commence in the GMH Sales department from 1/4/63, the Employment Manager, Mr Merv Giles, asked if I would like to first work for three months in the mailing room from 10/12/62, the first day after my last exam. This chapter allowed me to note just how much I learned at 17 years of age in those few months, having access to high security areas such as the Experimental Garage, Styling Department, the Managing Director’s Office, the technical library and the private executive dining room. There were 10 mail boys covering 10 different mail runs throughout the vast Fishermen’s Bend facility and we all did a different mail run each week. This meant in those three months I got to meet about 70 different secretaries of the various bosses in each department. By observation I learned so much about bosses’ behavioural patterns’, in particular the high proportion who took themselves far too seriously and were too pompous and stuck up to even say good morning to the polite mail boy! The secretaries, however, were all fantastic and assisted my inquisitive mind greatly as to who, how, why, everything ‘ticked’ in each business division. When my cadetship commenced I had a knowledge and understanding of every single pocket of GMH, from the Executive offices to the Foundry, to which many people who had been closeted at their desk for five years had never been exposed. In this chapter I take delight in comparing the raw realities of working at the lowest level possible in the Corporation to nine years later earning various promotions that gained me eligibility into the private, strictly invitation-only Grade 9 and above executive dining room. The contrast was disgracefully palpable, as one witnessed too many senior executives playing a game of elitism and being too far separated from the realities of the other 98 percent of employees in the company. Another chapter touched on 20 of my most memorable ‘Hits and Misses’, which covered so many humorous experiences and events over the journey. The final chapter is a reproduction of my 66 personal diary notes on the events leading up to and following the Peter Brock/HDT/Holden collapse, when Holden did everything humanly possible to stop Peter getting involved with his mystery ‘Energy Polariser’. This outline of 66 notes is the first time in 30 years my inside detail has ever been exposed and which ultimately lead to the start of HSV/HRT and my role there. So it has been for me ‘55 years in Car Heaven’, all made possible by the outstanding experiences of working closely with people close to the Car and Motor Sport industry. I often reflect that the positions and roles I have been in took me outside the four walls of my office and, as a consequence, my business horizons were expanded massively, given my dealings with over 500 car Dealers, 75 different motor sport sponsors, 20 racing car drivers, fleet owners, politicians, lawyers, accountants, tax consultants, race teams, advertising/marketing/PR agencies, media/journalists, apparel companies, owners clubs, finance companies, banks, sports management groups, designers, sales trainers, leasing companies, event management companies and auto auctions, to name a few . The new season kicked off with the major Adelaide 500 race being conducted 1-3 March. As has been the tradition of the past two years, we again submit some tips and predictions of two renowned motor sport journalists, Mark Fogarty and Paul Gover, armchair expert and enthusiast, Sterlo, and the writer (who fluked picking last year’s Quinella of Whincup 1st and McLaughlin 2nd). 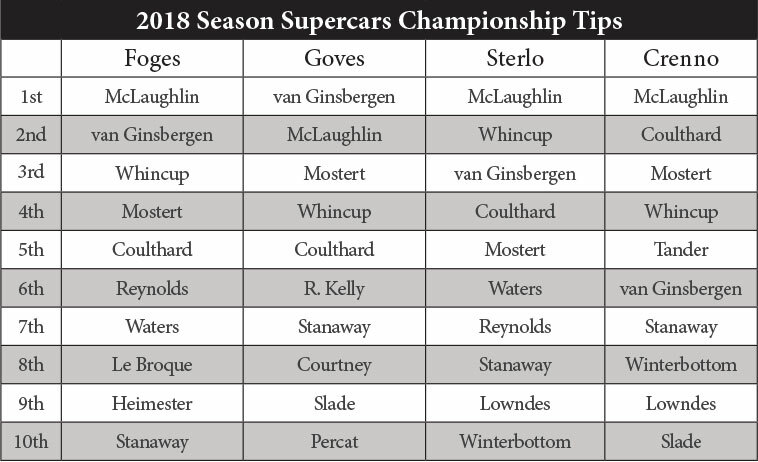 Based on this year’s tips Scott Mc Laughlin starts favourite, with only four others – Van Gisbergen, Whincup, Coulthard and Mostert – scoring enough votes to put them in contention the Championship. Some big names – such as Lowndes, Winterbottom, Courtney and Tander – are missing from the pointy end of 2018, but there is great interest in Richie Stanaway, who came in sixth in aggregate numbers. I have only ever had one telephone conversion with you, but you certainly left a very positive impression on me. I imagine that I would enjoy reading your book as your career follows a path that I could, perhaps should, have taken myself! From just an 11 year old during the early 1960s I have continued to have a big interest in General Motors and its various brands. In particular Chevrolet, Cadillac and Holden. GM has a proud history and in many ways invented sound business practices that are used worldwide today. My garage contains three classic GM vehicles that have been restored to as new condition and they remind me of the company that GM once was. You should feel very proud to having been an important part of General Motors and its success, but equally must be dissappointed at the direction GM is taking itself today. One wonders what today can be added to GMs heritage collection and or its rich history. Perhaps the return of the Chevrolet brand to Australia by HSV is a positive sign, but is it a case of ‘two little, to late’?